The Australian Government is a major investor in the creation and development of intellectual property (IP) through its many activities in science, health, education, public infrastructure, information technology, defence and arts and culture. 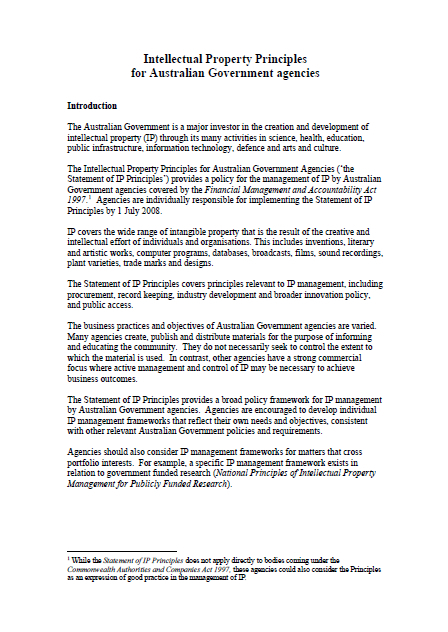 The Intellectual Property Principles for Australian Government Agencies (‘the Statement of IP Principles’) provides a policy for the management of IP by Australian Government agencies covered by the Financial Management and Accountability Act 1997.1 Agencies are individually responsible for implementing the Statement of IP Principles by 1 July 2008. IP covers the wide range of intangible property that is the result of the creative and intellectual effort of individuals and organisations. This includes inventions, literary and artistic works, computer programs, databases, broadcasts, films, sound recordings, plant varieties, trade marks and designs. 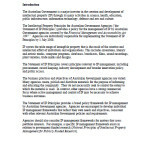 Posted in Asia Pacific, Defence, Education, Federal, Health, Information, Intellectual Property, Security, Technologies and tagged Agencies, Art, Australian Government, culture, Defence, Development of IP, education, Financial Statement, Health, Information Technology, Intellectual Property, Invention, IP, IP Principles, Management of IP, Media, principles, public infrastructure, Science, Statement of IP Principles.